Mark Jackson and Jane Jelbart are a dynamic, collaborative, flexible, fun and funny workshop and performance powerhouse. Doing nine uke workshops every week back home for the last six some years has really helped hone their uke and singing teaching skills. For Mark and Jane, it’s not about them. It’s about the festival participants and the spirit of the place and the times in which they are immersed. 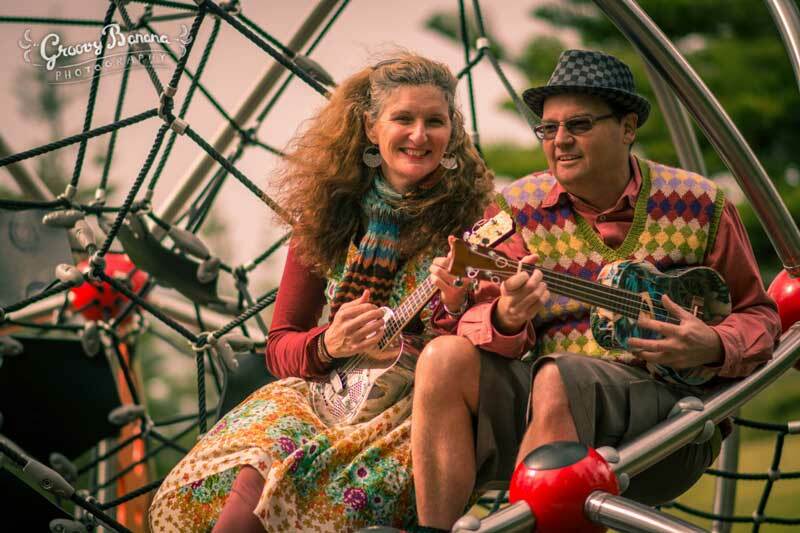 Mark and Jane are participating in the 2017 Uke Muster Festival with the assistance of South West Arts, Regional Arts NSW and Arts NSW. Deni Uke Muster regular Sarah Carroll has performed at most of Australia’s high-profile festivals over a 25 year career. She launched her epic progressive country album Star Parade in March with new band The Left Wing. Sarah made her third trip to Americanafest in Nashville this year to play with heroes like Anne McCue and Tommy Womack, and represent her country at Sounds Australia events. Last year, she made a stop on the way to the island of Oahu. 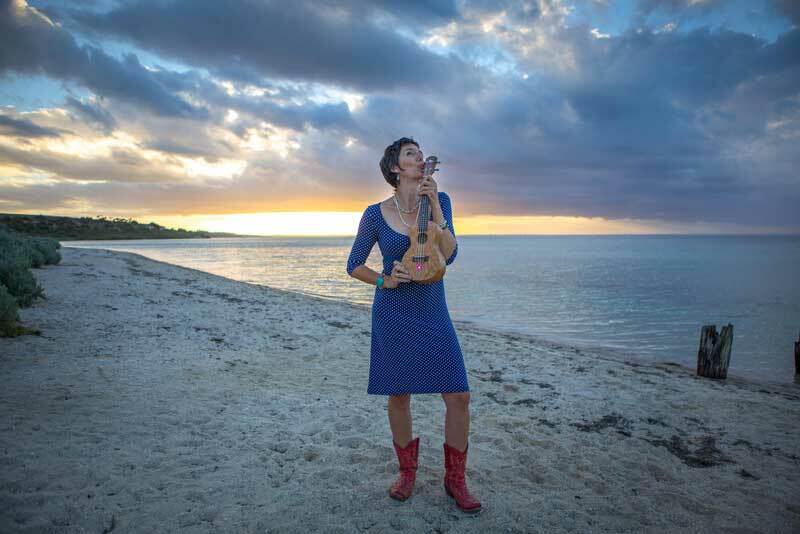 In Hawaii, she focused on teaching and learning more herself, taking advantage of numerous opportunities to jam with traditional local musicians. Sarah is an experienced radio broadcaster and music writer, having most recently published an interview with her favourite American songwriter, Robbie Fulks in Rhythms magazine. 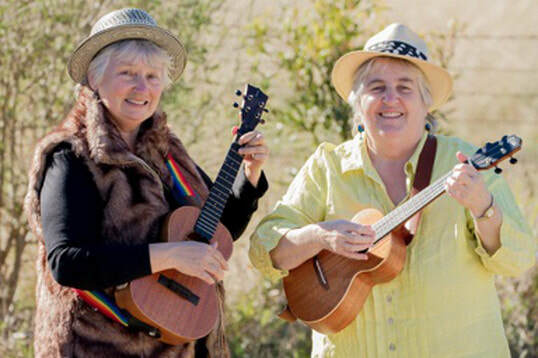 Those Shameless Hussies are Cathy (Fast Fingers) Welsford and Angie (Random Chords) Smith. These wild women from the lunatic fringe have performed together for 30 years, singing their way through numerous political upheavals, social revolutions and just plain standing up against injustice! While Fast Fingers plays a range of instruments, Random Chords firmly believes black dots on paper are probably stuck dead flies that can be picked ’n strummed to create totally hedonistic music. They write their own songs and fearlessly adapt others to their own unique style. When they sashay on stage you are always guaranteed a good time. 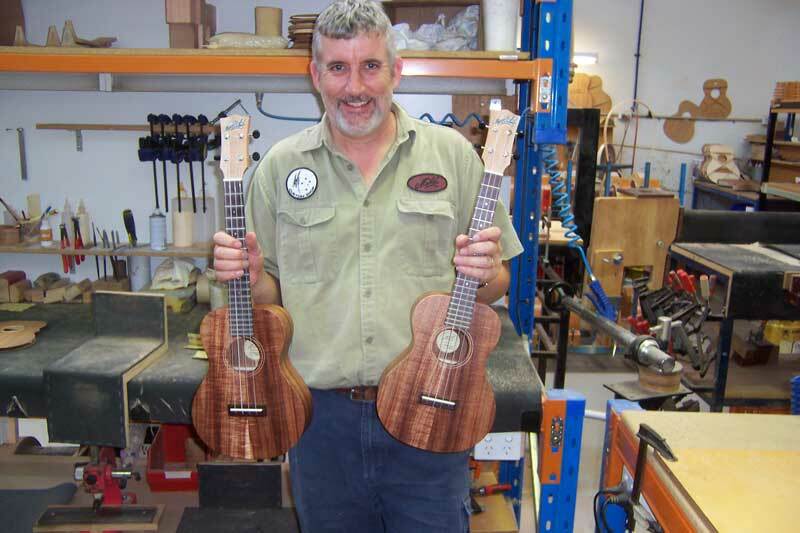 Guitar/fretted instrument tutor and founder and leader of the Deniliquin Uke Muster for six years, Chris Bodey has had over 40 years playing experience. Studying with John della Torre and Valentin Sawenko on classical guitar, Chris has a broad understanding of teaching methods. Added to Chris’ classical guitar studies is many years of playing solo, duo and band gigs on all styles of guitar and bass, double bass, mandolin and, most importantly, the ukulele. 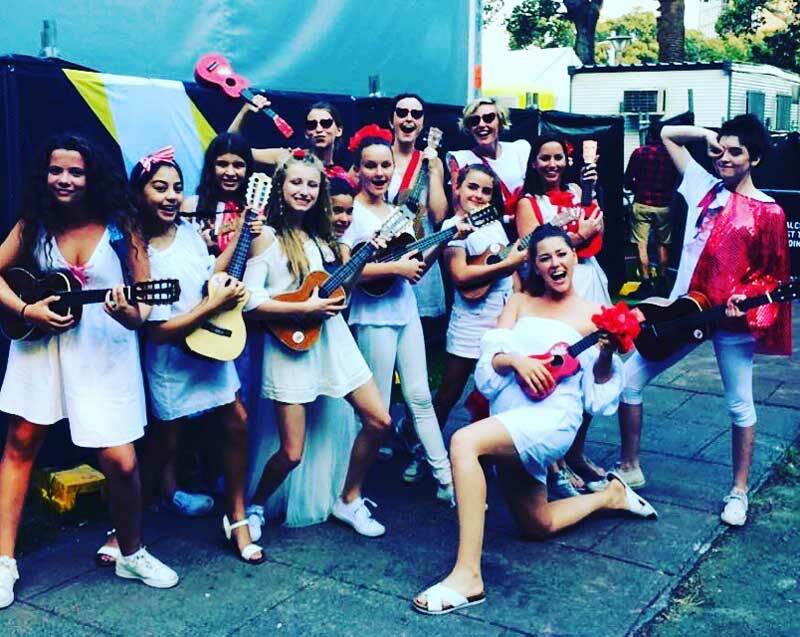 Bursting with happiness the Toy Choir brings the sweet perfection of young voices with the joyous sounds of sugar pop harmonies and infectious ukulele strumming. Founded and directed by Danielle O’Keefe, the Toy Choir is an independent youth ensemble dedicated to excellence in choral ensemble work and the development of young artists in singing, song-writing and performance. They have had an AMAZING first year, debuting at Mardi Gras, working with Sydney Chamber Opera and singing at Festival Garden for Sydney Festival. In 2017 the group travelled to Lake Cargelligo, Cooma and Nimitabel to run AKIN song writing workshops with girls aged 10-18. The Toy Choir is super excited to be coming to the Deni Uke muster in 2017. Patrick Evans has been making music his whole life. From his heartfelt original songs of Australian life to his unique treatments of traditional folk songs and fiddle tunes, Patrick uses his music to take audiences on a journey through his musical heritage and experiences as well as a journey through some of Australian culture's highways and byways. A skilled singer, songwriter, guitarist, fiddle player and entertainer, Patrick is also a senior guitar maker at Maton Guitars and recently had his song This Old Guitar played around the world as part of a promotion for the Biesse machines that Maton use to help make their guitars. His song The Cooee March was also featured on ABC Radio's Australia All Over to help mark the 100th anniversary of this little known chapter of Australian history. Patrick can often be found backing other musicians and has worked with a veritable who's who of Australian folk music over the years including Danny Spooner, Ross Ryan, Hugh Macdonald, Marcia Howard, Janette Geri and Suzette Herft.